Leading brand Nescafé impressed our panel of expert judges, scooping both of our Best Buys. But Starbucks failed to excite. Wholebean instants are a range of premium instant coffees that contain finely ground coffee beans, and are more expensive than standard instant. We put 11 products through our expert blind-taste test to see if they are worth spending that bit extra on. Our experts rated both products by Nescafé – Nescafé Azera and Nescafé Azera Intenso – as the best on test. The Which? expert panel praised the overall winner Nescafé Azera (£4.99, 100g, 82%) for its ‘malty, treacle, toffee aroma’ and authentic taste. Two experts went as far as saying ‘it doesn’t taste like an instant’. 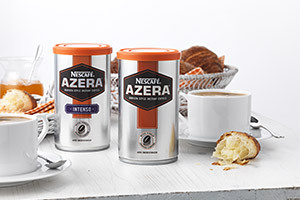 The other Best Buy, Nescafé Azera Intenso (£4.99, 100g, 77%), impressed the panel with its ‘good crema of frothy bubbles’ and an aroma of ‘warm, chocolatey notes’. But the panel weren’t impressed with all the coffees. Starbucks Via Ready Brew Italian Roast Extra Bold (£4.95, 12 sachets) was one of the most expensive on test and scored only 40%. The panel said they definitely wouldn’t recommend this coffee, describing it as smelling ‘chemically’ and ‘rubbery’ and the body as ‘thin and insipid’. Overall, yes. Wholebean instants cost more – 4 to £5 per 100g, compared to Nescafé Gold Blend at £3.34 per 100g. But compared to standard instants, our experts agreed these wholebean instant coffees offered a better coffee experience. However, they all said the wholebean instants still lacked the complexity that you would find in a ground coffee. So they wouldn’t be ditching their ground coffee just yet. Our panel consisted of expert tasters Giles Hilton, Colin Smith, Marc Dietrich and Charles Metcalfe. They rated each coffee on smell (prior to tasting), appearance, aroma, flavour, body, sweetness and aftertaste to give a total score out of 100.